Clay cookware brings traditions to the kitchen and tenderness to recipes. Since their invention about 12,000 years ago, clay pots have been used for good cooking and good eating across cultures and geographies. 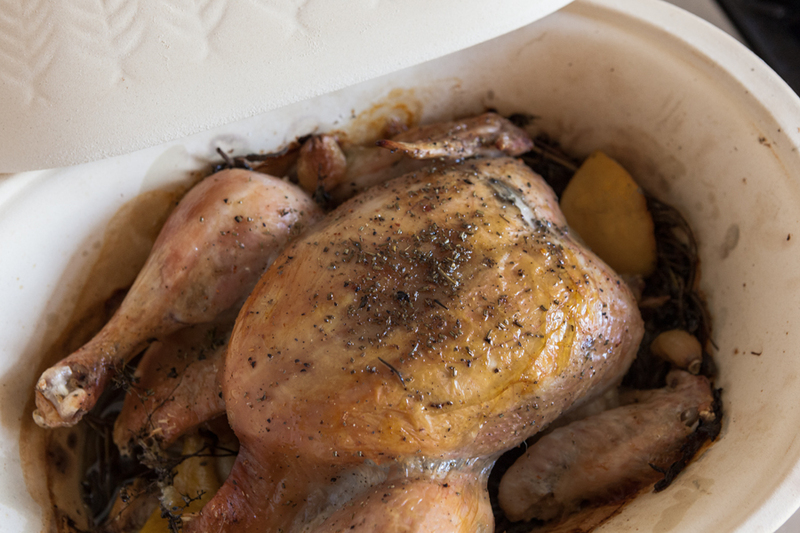 Clay vessels have unique properties that make them ideal for roasting, baking, steaming, and braising. The porousness of the material allows for heat and moisture to slowly circulate around the dish while it cooks. This makes the resulting food more tender, juicy, and delicious. There are health benefits associated with clay cooking. Recipes do not require as much oil or fat because clay naturally draws out the rich flavors by heating evenly and recirculating steam. Some claim that clay cooking retains vitamins and minerals that otherwise would be lost in the process. Also, the alkaline in clay balances out the acidity in food, which makes the flavors more coherent and rounded. Cooking and serving in clay cookware encourages a certain thoughtfulness in the kitchen. Gathering for a slow-cooked meal becomes a sought-often moment of respite. We offer a selection of clay cookware pieces, each with a unique story to tell. These made-to-last vessels are a way to connect to traditional cooking techniques from around the world and make your own memories. Chamba cookware is handmade by local artisans in La Chamba, Colombia, out of natural clay. Each piece is burnished with stones and fired on site. Chamba earthenware pieces are unglazed; their distinctive black color coming from the clay and how they are fired in the kiln. We use Chamba dishes in our Café because they retain the heat well from our oven to your table. The smooth black finish makes the vessels appear strikingly modern. However, the origins of the vessel’s design can be traced back 700 years to pre-Columbian archaeological sites. 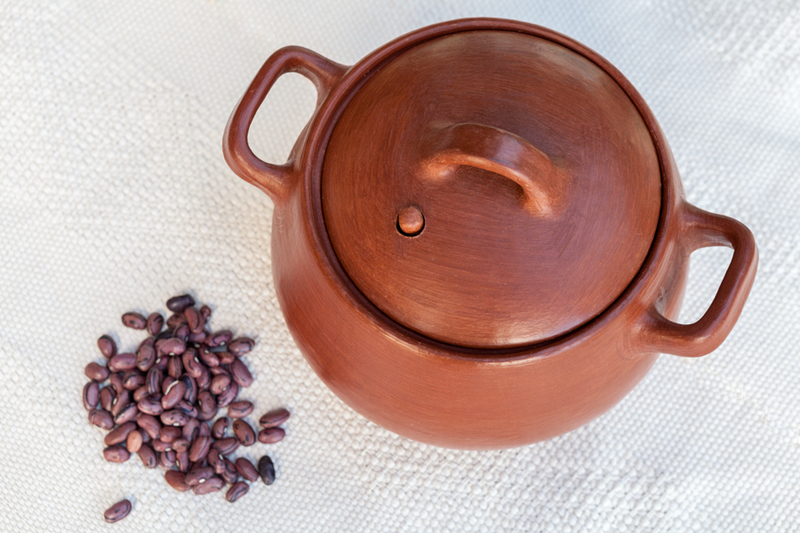 The Chamba roaster and bean pots are designed for cooking meats, stews, and pulses. 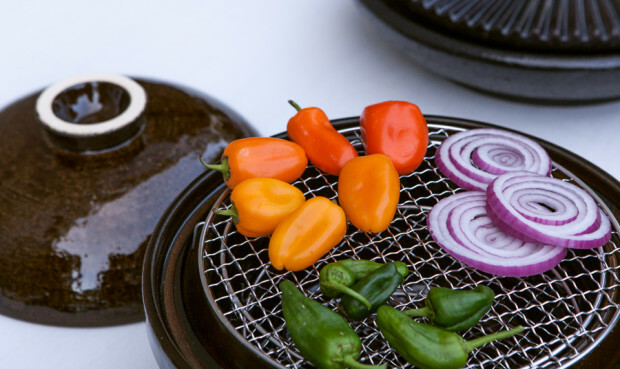 The lid-less options are the Chamba Oval Platter for roasting and baking, and the Chamba Comal for heating tortillas and roasting chilies. We are proud to offer a selection of clay earthenware from Oaxaca. These pieces were created in San Marcos Tlapazola in collaboration with Colectivo 1050º, a design guild devoted to maintaining and advancing Oaxacan craft tradition. There are over seventy pottery villages in Oaxaca, each with distinct workshops and artisans. Eric Mindling’s book Fire and Clay: The Art of Oaxacan Pottery is an essential introduction to the culture imbued in Oaxacan pottery. The Elia Cooking Pot is suited for beans, soups, and braising meat. The Elia Rice Pot can be used for rice and other grains. The Clay Grill is a portable grill for meat and vegetables, as well as a mobile stovetop for cooking soup and warming tortillas. It is an intricately made and striking to watch in action. Founded in 1875, Manufacture de Digoin originated as a family ceramic business in the northern Loire valley and established itself crafting staples of the French kitchen. Digoin specializes in earthenware and stoneware made from local materials. Each piece of pottery is hand-shaped by artisans and made to stand the test of time. We source our donabes, traditional Japanese clay pots, from the Nagatani-en clayware house founded in 1832. Nagatani-en is the leading producer of Iga-yaki pottery, which is crafted from clay from the 4-million-year-old seabed of Lake Biwa. Iga-yaki donabes are handcrafted, each taking two weeks to complete. Donabe cooking has been traced by 10,000 years, yet the vessel remains a modern kitchen staple. The Donabe Clay Smoker can be used for grilling vegetables and fish (here’s our getting started guide). Due to its thick clay body, the Donabe Rice Cooker steam-cooks rice even after it is removed from the heat source, making the rice extra fluffy. The Donabe Clay Steamer is an impressive cooking and serving vessel well-suited for fish, chicken, or vegetables. 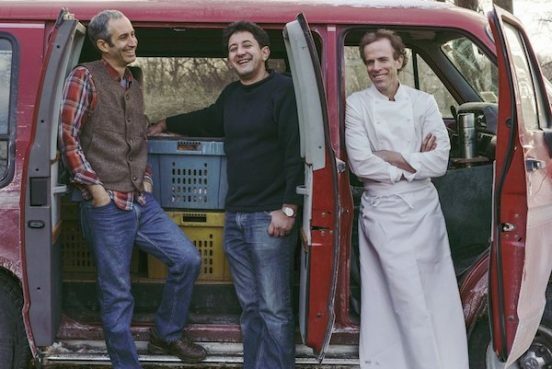 Dan Barber’s Row 7 Seed Co.
Dan Barber is more than a chef or restaurateur, he’s even more than an author. 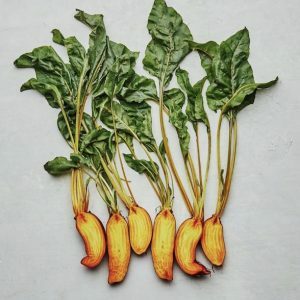 With the launch this year of the new Row 7 Seed Co., a collaboration with seedsman Matthew Goldfarb and plant breeder Michael Mazourek, Barber is now also a botanical innovator, aiming to input deliciousness into plants from the seed forward. It’s a radical idea that’s already working. Witness the success of the Honeynut, a squash Mazourek — an associate professor at Cornell — developed some eight years ago at Barber’s request. Boasting a higher nutritional quality and greater sweet profile than the Butternut, the Honeynut’s pure deliciousness prompted star chefs and even such outlets as Vogue magazine to support it. The exposure made this squash a culinary hit and today it’s readily available at Whole Foods Markets and other ordinary outlets. Developed to entice a child, the Badger Flame beet has none of the earthiness of traditional beets, but is sweet enough to be eaten raw. Barber comes to our Modern Grange on Oct. 10, 2018, to introduce Row 7 Seed Co. in an event dedicated to good farming, good cooking, and good eating with a who’s-who roster of West Coast chefs. We expect that one of the first questions he’ll address is this basic: What’s so radical about breeding for flavor? And here’s what we reckon will be one of his answers: Flavor is typically last on the list when large seed companies are involved. Rather, large corporations breed for portability, chemical symbiosis (as with those seeds made to interact with Monsanto’s Roundup), uniformity of size and shape, and the varied notions of attractiveness that arise when one considers such as a tomato. Durability and disease resistance are bred into Row 7’s seeds so that they don’t need to interact well with Roundup or other chemical inputs; they’ll be robust enough to resist pests and other dangers all on their own. Ultimately, the delectability of the produce and its nutritional value are the first concerns. Unlike other breeders, Row 7 has pledged not to patent their line of seeds, encouraging users to acclimate to their particular spot in the world. They’re even working to make the leaves and stems of their squash delicious and edible. And of course, the seeds are non-GMO, organic, produced without chemicals, and grown in the USA. When you’re going to do something good, why not do it all the way? That’s the idea with Row 7. To do something good — all the way. Its initial seed slate includes the Badger Flame, a sweet orange beet that can be eaten raw; the Habanada, a habañero pepper with all of its floral notes retained without the heat; a potato that tastes as if already buttered; a cucumber with the yummy bitter edge that’s been bred out of most stock; and a squash that changes color on the vine to indicate ripeness. At our own HomeFarm, we’re supporting Barber’s efforts by growing his Habanada and Badger Flame varieties for our produce shelves. We grew Row 7’s new line of peas last spring. Our friends at SingleThread Farms are growing some, too. One of the genius beliefs that the folks at Row 7 hold is that chefs can actually influence supermarket choices by popularizing produce through their own artistry and evangelism. Actually: it’s all genius. Dan Barber hosts a sold-out Row 7 Seed Co. dinner with us on Oct. 10. 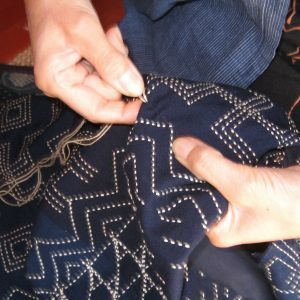 Sashiko stitching is an art form that evolved from a simple need. 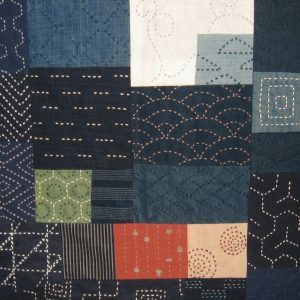 Sashiko means “little stabs,” or “little piercings” and is a folk textile method traditionally featuring white stitches on an indigo background. Sashiko began in the North during the Edo period (1603-1868) and moved south along traditional trade routes. The plain running stitch of thick cotton thread makes striking geometric designs on the fabric, and allowed working people to have warm, decorative clothing that was within the confines of the law. As chilled as it makes us to even imagine, 17th century Northern Japanese farmers somehow worked outside in clothing woven just from hemp or linen, fabric that offered just barely enough protection from the fierce winter cold. Industrial fabric production didn’t come to Japan until the late 19th century and then, it was too expensive for most people to afford. Cotton doesn’t grow in northern climes. 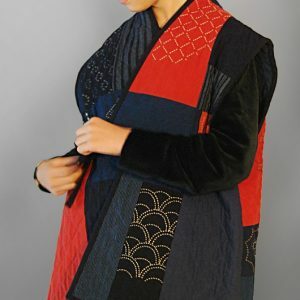 Even if the farmers and fishermen’s families of Northern Japan could afford to use silk, it was illegal for citizens of those classes to wear it, as it was also forbidden for them to use bright colors or vibrant patterns. With fabric so dear and rare, each piece was carefully saved. Mending pieces of hemp fabric, traditionally dyed with indigo, allowed wives and daughters to stitch warmer pieces of clothing, adding layers from old scraps and cleverly incorporating a quilting style of piece-work that made for a more durable, more thermal, and ultimately — more beautiful items of clothing. As the centuries progressed and cotton became more available, it was swapped for hemp and sashiko styles became more artistic and purposeful, with an aim beyond merely keeping the wearer warm. 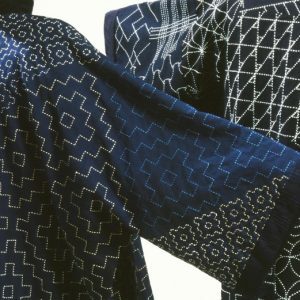 Strengthening and adding bulk to fabric, quality sashiko stitchery eventually became a measure of suitability for young women hoping to marry, as sashiko-stitched kimonos were part of a traditional dowry. Heavily padded sashiko garments were used by 18th century firefighters who would first soak their clothing with water, adding as much as 70 pounds to their frames, before combating fires. Today, sashiko stitchery adds a gorgeous note to handmade textiles and remains a beautiful way to mend such indigo as blue jeans or other clothes that deserve to be mended and amended, their beauty retained and appended. 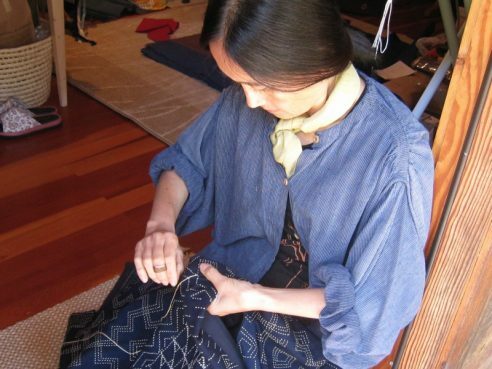 Textile expert Marico Chigyo teaches a sashiko class at SHED on Saturday, July 7, from 10am-1pm. The images on this page are from her Chigyo Studio. Please plan to join us! Yet, if you’ve ever enjoyed a cassoulet or confit, delighted at a preserved lemon tucked into a dish, fluffed couscous with a fork or cooked in a tangine, you owe a culinary debt to Paula Wolfert — even if you’ve never heard of her. Paula is the intrepid food journalist and chef who brought such delicacies as cassoulet and preserved lemons to American palates via her nine cookbooks, beginning with Couscous and Other Good Food from Morocco, published in 1973. Following her first husband to Morocco in the ’60s, Paula became restless with the ennui of the bohemian expat crowd and instead turned her fine intelligence to the sights and smells of the souk, and finally to the kitchens and tables of the Moroccan people who frequented its food stalls. Famous for nearly moving in with her subjects, Paula eventually found ease with seven languages, allowing her to move into the kitchens and homes of people across western Europe. An expert on Mediterranean cooking, including our favorite Clay Pot Cooking, Paula introduced French country cooking to an avid audience. Now 78, Paula is a longtime resident of the town of Sonoma, where she shares a home with her husband, the writer William Bayer. She’s still on a mission, but its aim has altered. Diagnosed with Alzheimer’s in 2013, Paula can no longer differentiate tastes but she can still enjoy the kitchen. Rather than examine the traditions of a particular geographical area, her focus today is on brain-healthy foods that she hopes will forestall the worst of her disease as long as possible. Paula’s editor Emily Thelin (pictured above) realized that now is the time to capture Paula’s food memories and best recipes in a new collection and set about trying to sell the proposal through regular New York publishing channels. No one committed. So she did what we do these days, she took it to Kickstarter, where 1,112 people donated to the cause, raising $91,000 and catching the interest of both famed food photographer Eric Wolfinger and acclaimed food writer Andrea Nguyen, who agreed to edit the text. The resulting book, Unforgettable, gathers together some of Paula’s favorite and most iconic recipes along with a lively biography peppered with intelligent asides by Thelin throughout. A loving and alacritive recent article by New York Times food writer Kim Severson looks at Paula’s current life, after the book’s publication, where she is still active in the kitchen and able to surprise both her biographer and her assistants. Accompanied by photographer Wolfinger, Thelin and Paula come to SHED on Sunday, June 4, for a special celebration dinner. Each diner will receive a copy of Unforgettable as part of the night. Our chef Perry Hoffman has created a splendid Middle Eastern-themed dinner in Paula’s honor. It appears that there’s more to learn from Paula after all. 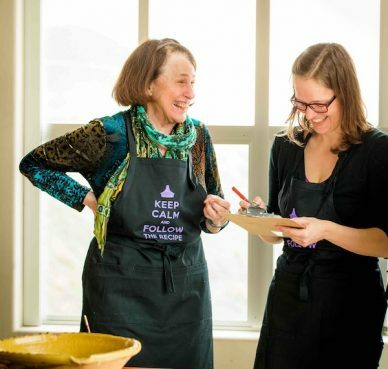 The Unforgettable dinner honoring Paula Wolfert is slated for Sunday, June 4, from 5pm. $115 per person; includes the book. RSVP today. We’re excited to announce the launch of the SHED pantry line, featuring a proprietary collection of powders, salt blends, herbs and spices, preserves, pickles, and Shrub concentrates drawn from the best ingredients prepared just as we do in our Healdsburg café. Coming to fruition under the direction of SHED chef Perry Hoffman, plans for the Pantry Line predate SHED and its café. SHED co-owner Cindy Daniel knew that she wanted to do this before our doors even opened. A distillation of flavor, the SHED powders are a unique finishing touch that pack a punch. Available in one-ounce bottles, they are the essential taste of the vegetables from which they’re made. Dehydrated in our own kitchens and then pulverized before being mixed with Jacobsen Salt, these powders are intended to be used just before serving to add a strong note to your good fresh food. Perry likes the Charred Eggplant Powder sprinkled atop a bowl of yogurt with fresh chopped mint. He mixes it into vinaigrettes, and hails it as his “love letter” to the baba ganoush dip he adored as a child. The Tarragon Caper Powder is a nod to traditional French cuisine, adding a note of elegance perfect for using to finish sauces. “Capers and tarragon are two ingredients that are made for each other,” Perry says. The Niçoise Olive Powder is purposefully not powdered entirely. “We leave this a bit chunkier and just smash them into little crumbles because we love those little bits of dried olives,” Perry says. SHED’s blends use Jacobsen Salt as a base and add unusual flavors to create finishing salts you’ll always want to reach for. An incredibly versatile and popular offering, Lemon Salt can be sprinkled liberally atop roasted potatoes and fish. For dessert, try a pinch with vanilla ice cream. Utilizing an increasingly popular Japanese culinary herb, our Red Shiso Salt is perfect for bringing a fresh taste to a salad before serving or for sprinkling upon fish. Normally not one to play favorites, Perry confesses that his favorite of the new line is the Black Lime Salt, which has a distinctly Californian take on a traditional Middle Eastern flavor profile. Limes are salted and soaked before being dried and pulverized, bringing an intensity to this salt. A drinking vinegar born from the need to use all of the harvest, the Shrub has recently come back into favor. And thank goodness for that. Shrubs are the centerpiece of the Fermentation Bar in our Healdsburg store and our flavors always change to match the season. This new collection of essential Shrub flavors is just the start; we’ll be certain to add more as the harvest wanes and new herbs, fruits, and flowers become available. Available in 12-ounce bottles, SHED Shrub concentrates form the base for a refreshing non-alcoholic drink but can just as easily be made with Prosecco or other lightly bubbly wines. 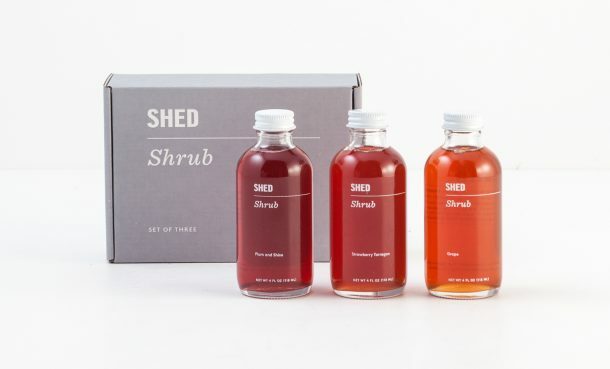 Whether Quince, Apple, Beet, or Grape — each SHED Shrub concentrate is made from organic ingredients raised by farmers we know or even foraged by Chef Perry himself. What’s more, his technique for creating this concentrate hasn’t change. For a few hundred years. “We do this just as they would have in the 1800s,” Perry says. Having fresh jam made with local fruit is a hallmark of the SHED café and our pantry. A devoted home cook, Cindy has always spent part of her summer putting up preserves. Now you can share in some of our good fortune and bounty. Each jar is made of pure organic or even foraged fruit set with cane sugar and a good squeeze of lemon juice. That’s all. SHED honey is raised in Sonoma County by beekeepers who respect their hives and the hard-working insects inside of them. SHED subscribes to the idea that we don’t keep bees — the bees keep us, as one-third of all the food that we eat is made possible by pollinators. Fermentation is a core value at SHED. “We pickle everything. It was so hard to even choose what to put in the jar,” Perry says. Packed like the Conserva in 13.5-ounce jars, our Pickled Carrots are flavored with dill leaves, jalapeños, and black peppercorns; the Pickled Turnips with bay leaf, beets, and garlic. Both of them are perfect additions to supper, laid out on a relish plate to contribute bite and interest to a simple meal. Also jarred up for a pre-dinner pickle plate are our Pickled Shiitake Mushrooms, Roasted Eggplant Conserva, and Turmeric Pickled Turnips. With this Pantry line-up, SHED is also proud to release its own line of herbs and spices, adding traditional everyday spices like cinnamon to a line-up of offerings that include the Middle Eastern flavors of Harissa, Zahtar, and Vadouvan. We have other unusual mixes like Shichimi Togarashi, Japanese Curry Powder, and Chinese Five Spice. Our own line of Dukka is already a best-selling staple. We even have six kinds of peppercorn! SHED’s Pantry line is an effort to preserve the peak flavors of the season by pickling, preserving, fermenting, smoking, and drying ingredients to make jams, pickles, shrubs, spice blends, and powders. It’s an attempt to better tell the story of good farming, good cooking, and good eating. “We want to take all of the behind-the-scenes things that we make and showcase them,” Perry says. “There are so many things that we have to make to stock our own pantry. The powders are a perfect example of that. We want to show what we make, and how we use these products to flavor and enhance our cooking,” he says. Yafa had a bowl full of love with him when he joined us in our upstairs Grange to demonstrate his sourdough starter recipe and support his new book, Grain of Truth: The Real Case For and Against Wheat and Gluten. An award-winning North Bay journalist and screenwriter, Yafa fell upon the topic of starters and yeast and gluten and wheat and lovers when his wife came home from a spa day announcing that she had “gluten neck.” Whatever that is. And indeed, what the heck is it? Yafa was intrigued. Grain of Truth follows wheat from the good old days when it harmed only those with true celiac disease through to today, where the majority of the wheat consumed in the U.S. has been disastrously stripped of its nutrition and vitality and is quite literally making us all sick. But none of this yummy goodness can happen without the starter — a mix of whole flour, water, wild yeast, and bacteria that takes about two weeks to mature and, when properly maintained, can last a lifetime. SHED’s pastry chef Lorrette Patzwald understands Yafa’s point of view. Patzwald has been so successful at keeping her starter thriving that she’s named it “Shirley.” Of course we’re not kidding. “Once I was able to get consistently good results with my new starter it was time to give her a name,” Patzwald explains. “Shirley is not just used for bread. She gives additional depth of flavor to the Little Shirley cookies sold at our coffee bar. She has also made appearances in pancakes, shortcakes, and waffles. Shirley has traveled to the Gold Coast of Long Island and to Greenwich Village for a bread baker’s competition. Once you have a stable starter — regardless of its name — you have the basis for your bread. 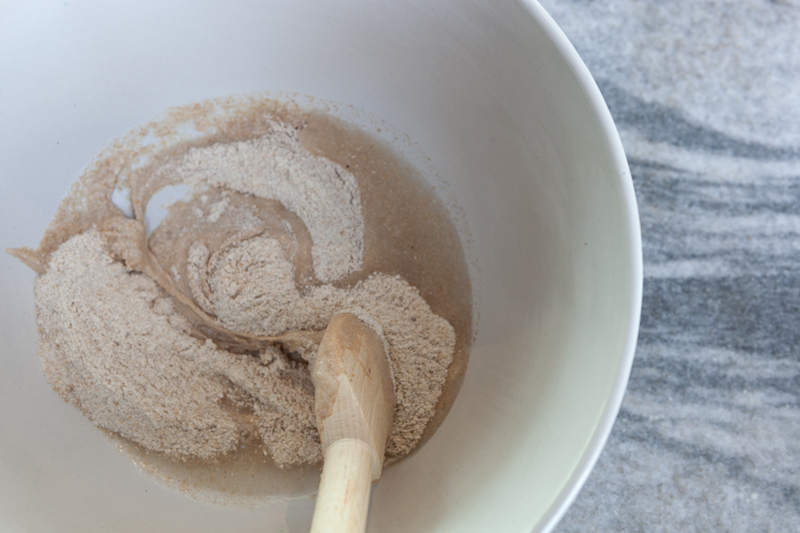 Using some of the starter, you add flour to create a levain basis for your loaves. 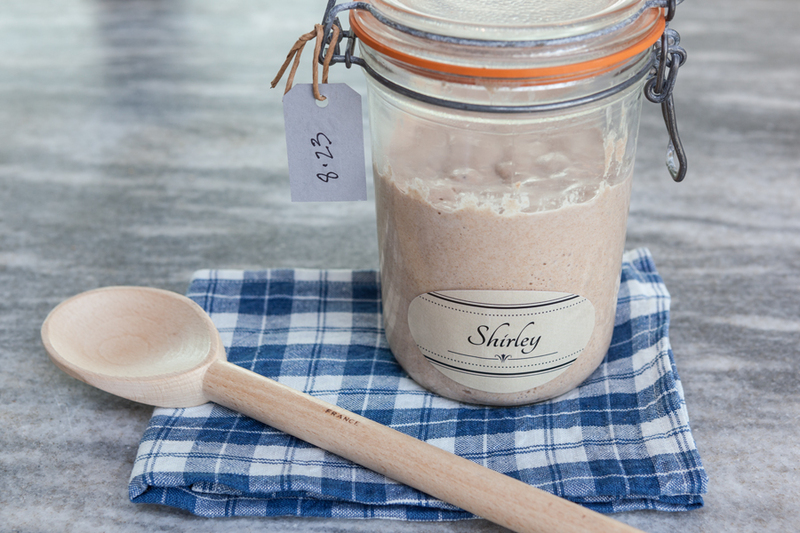 By taking some of the starter and mixing it with flour to make a dough, you’re also ensuring that there is enough starter to continue on to its next iteration. You want a wet dough, Yafa assured, and you want to slap it about to wake it up. Several audience members gamely stood with Yafa slapping dough to awaken its gluten. He appeared to be delighted. Use non-chlorinated filtered water for both your starter and your levain to nurture the growth of good bacteria. Use organic whole grain wheat or rye flours, not all-purpose. They’re more nutritious and offer more fuel to the microorganisms that will build your starter. An electric plant propagation bed used to help sprout seeds is a nice way to keep your starter warm during its first few weeks. Place your bowl on it and leave it. 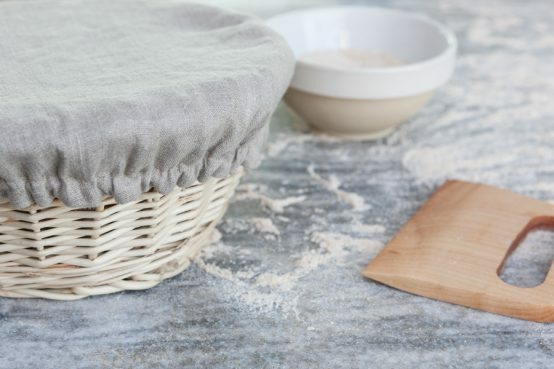 Try to use your clean, freshly washed and carefully dried hands to handle the dough, not a mixer’s dough hook. You can feel the gluten strands hardening and you can transfer more natural bacteria to your starter if you use your hands. Plus, it just feels good! Need help, direction, or inspiration? The King Arthur Flour website is Yafa’s go-to site. Copyright © 2019 Healdsburg SHED. All rights reserved.